I am offering my review copy to one Simplicity minded Reader!! Just leave a comment with your email address so I can contact you to enter to win, I will draw a winner using Random.org on Friday Aug 26th!! What value to you respect in the Amish? I like to joke around with my kids when they don’t have something that their peers have, like a cell phone for example, “Just tell your friends that your parents are Amish”! Oh I admire the values and character of the Amish people, the simplicity and the family dynamics that we so much seem to miss in the rest of America. As I began to read Suzanne Woods Fisher’s book I saw many ways that we can easily take the simplicity and apply it to our own lives, without becoming Amish and giving up electricity and higher education. Aside from religious preference, we can be very Amish in character and learn from their example. Suzanne frames each value with a Amish proverb that sets the tone for the story to follow. She then provides a real life example from an Amish family. Her next section is the ‘Road Map, Getting There from Here’ which shows how we can take the value learned and apply it to our own lifestyles. She then has quotes from the Amish in their own words. I love how she has organized the book, you can read a page or two at a time, and spend some time reflecting on each value. 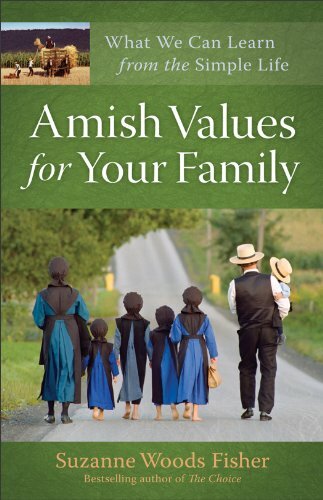 It doesn’t need to be read in one sitting, though you can if you want to be submerged in Amish values. I found when reading that many of the values that the Amish hold, were similar ones we took on when we moved out to the country. I think the country feel lends itself easily to the ‘simple’ life. And in simple, I don’t by any means say ‘easy’. The simple living is actually much more work involved than the ‘easy’ way of living. Raising your own animals, eggs, crops, baking your own homemade meals without convenience, sewing clothing and repairing things that break.. there is an easier way to do it, but the simple way seems to be developing more character in my family. Suzanne breaks the book down in to 4 sections. Section 1 Children are loved but Not adored. Now don’t read that and think the Amish don’t love their kids like the rest of the world, not at all. They don’t put the kids on the pedestal that we typically tend to do. Learn from each other, admit mistakes to one another, and embrace the extended family together. Make it about the family as a whole, not what best serves the children. Section 2 titled Great Expectations provides examples of values that ready children for mature living. The Amish provide a working example of sharing the household and farm responsibilities as a family, and on the job training that many youngsters aren’t getting today. In section 3 Daily Bread, the Amish Proverb “If God is not first in our thoughts in the morning, he will be last in our thoughts all day”, truly sums up what the section is about. They are putting God first in your day, and keeping Him in the forefront throughout. Draw on the characteristics of God, humility, forgiveness, joy and let them anchor each of your days. Finally section 4 is titled Letting Go. I love what Suzanne says in the intro to this section “If we’ve done our job and prepared our children to the best of our ability, we can let them have a little age-appropriate breathing room to practice decision making, to spread their winds, and learn from mistakes.” So true! This section not only talks about letting go in the teen years, but as toddlers, marriage and even death. Fantastic book full of wisdom that you can truly apply to your own family and you don’t even have to give up electricity to do it! Suzanne has done a great job taking the Amish values and helping us get from there to here, to a place where we can use the wisdom and make changes in our own families that hopefully will result in some of the characteristics we admire in the Amish. I also admire the simplicity of the Amish. We have so many things that are supposed to simplify our lives, giving more time to do other things, and that's exactly what we do....fill up our time with other things. What a lovely review. I appreciate the Amish way of life very much. They are amazing people. I'm not wanting to enter the giveaway but wanted to tell you: what a lovely review! I like the way you broke it into sections. I would love to learn more about the Amish and simplify my life. Thank you for the giveaway. I enjoy the way the Amish raise thier children. I love the way the Amish place God at the head of all of their decisions. I admire how they're so talented. They farm, they sew, they cook, they spend quality time and somehow they look good doing it all. Life is just so simple for them. I met a girl in College who spoke to our class and she grew up Amish. Her family left the community when she was a teen. It was amazing to hear about her life. She talked about all of the differences. She could sew a completely new dress in one evening. There is so much to admire about them and their due diligence to work, family, and religion. Amazing! Fantastic review Melanie. I have to say I love the fact that the Amish place such high value and importance on God and family. We all seem to lead such chaotic lives that it's important to stop, take a moment, and remember to simplify. Thank you for the opportunity to win this giveaway. Excellent review, Melanie. I really enjoy your reviews. I have been blessed a lot by the neighborliness of our Amish neighbors. They are quick to lend a hand and help out in times of need. I often wonder if the Amish and small farmers would be the only survivors in a global disaster. Most people would not know how to survive on their own. I'm open to learning a new perspective.